← What can I grow in (partial) shade? In structural terms reciprocal roof structures are ‘three dimensional assemblies of mutually supporting beams’. But behind this definition lie some breathtakingly beautiful and complex structures at the heart of buildings both ancient and modern. 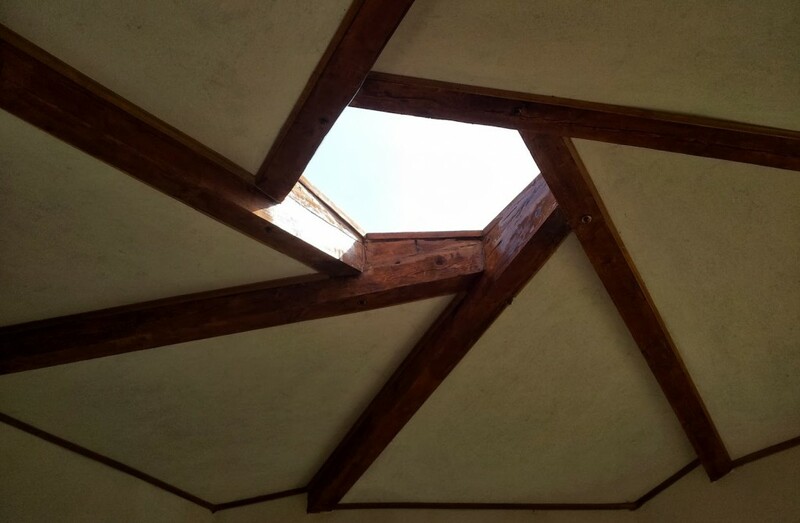 A reciprocal roof must be formed by a series of 3 or more interlocking beams. This forms a structure with an atrium in the center which may be used to provide light and natural ventilation to a building. The simple structure is geometrically intricate and very strong. The size of the atrium, number of beams, thickness of beam are all variable and determine the pitch of the structure. All of the dimensional factors: pitch, diameter, depth of beams are mutually dependent. The interdependent nature of the Reciprocal Frame means that any load is immediately shared by all the beams in the array giving it great strength and stability. The Reciprocal Frame form is an expression of a vast matrix of geometry that can be found embedded throughout our natural world. It is this that makes it so familiar, obvious and reassuring. A reciprocal roof is assembled by first installing a temporary central support (charlie stick) that holds the first rafter at the correct height. The first rafter is fitted between the wall and the temporary central support and then further rafters are added, each resting on the last. The final rafter fits on top of the previous rafter and under the very first one. The rafters are then tied with wire before the temporary support is removed. For added support of to establish sufficient spacing for further construction secondary rafters can be added between primary rafters. 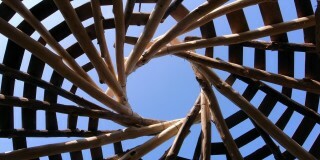 The reciprocal frame, is also known as a Mandala roof. Reciprocal roofs have been used since the 12th century in Chinese and Japanese architecture. Although little or no trace of these ancient methods remain. Villard de Honnecourt produced sketches showing similar designs in the 13th century and similar structures were also used in the chapter house of Lincoln Cathedral. 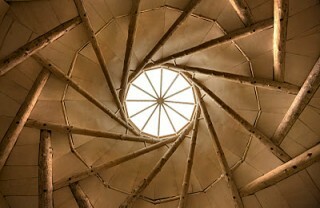 The reciprocal roof was independently developed by Graham Brown in 1987 and is becoming a popular roof construction technique for eco self-build community and particularly for modern roundhouses. Dit artikel is geplaatst in construction en getagged building, construction, frame, reciprocal, reciprocal roof, roof, science, structure, understanding. Bookmark hier de permalink.